Psychotron gets really burned up when Heatwave and Cyblade torch him with sub-atomic plasma particles. Cyber battle: Code Green…Mission accomplished! Founding member of Cyber Force along with Heatwave and Major Stryker. Cyber Skills: Cybernetic ability to fire "blades" of electromagnetic energy from her fingers. Martial arts expert and powerful hand-to-hand combatant. Dangerous, psychotic criminal released in Cyberdata's custody. Can project intense plasma beams up to 8000 degrees Fahrenheit from his arms. Violent outbursts and incredible strength make him a deadly adversary. 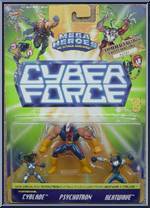 Commander and fearless leader of Cyber Force. Cyber Skills: Can fire sub-atomic particles with a force equivalent to 500 lbs of TNT. Able to fly at speeds in excess of 400 M.P.H. by riding super-heated air currents. Contribute pictures, update details or suggest corrections for Cyblade / Psychotron / Heatwave. Write a review about Cyblade / Psychotron / Heatwave.